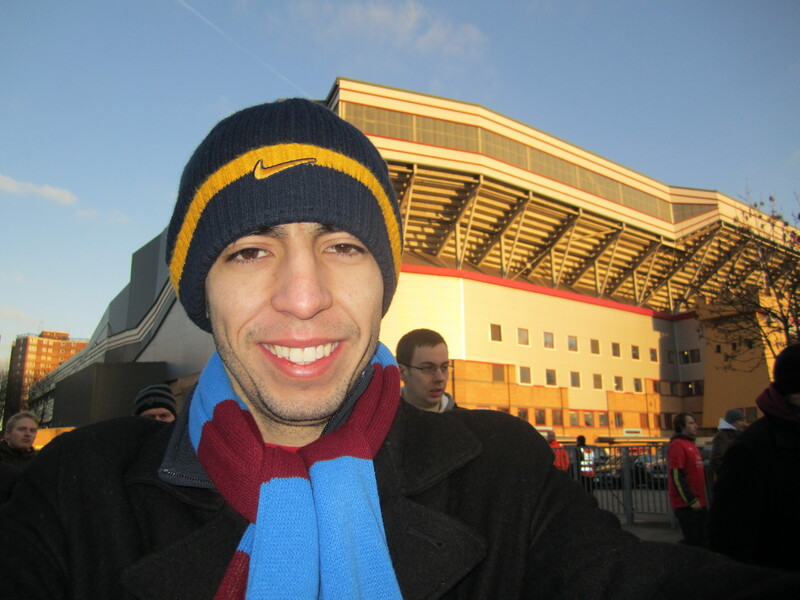 My journey to see European soccer stadiums made its second stop in the east side of London to see the team inaptly named West Ham. Now going to this game was a tough choice because of all the “major league” teams in London, West Ham is the furthest and, plain and simple, the worst. There were also two other intriguing games that day that I could have chosen from. Arsenal was playing at home and there were even tickets available the night before, a rarity because they usually sell out months in advance. Across town, Fulham, the team I went to see last week, was hosting another London club, Tottenham. This game was uber appealing, however, I had just been to Craven Cottage and felt there would be many more opportunities to return. In the end, the fact that I only paid 17 pounds for a second row ticket put the nail in the coffin. I was off to see West Ham. 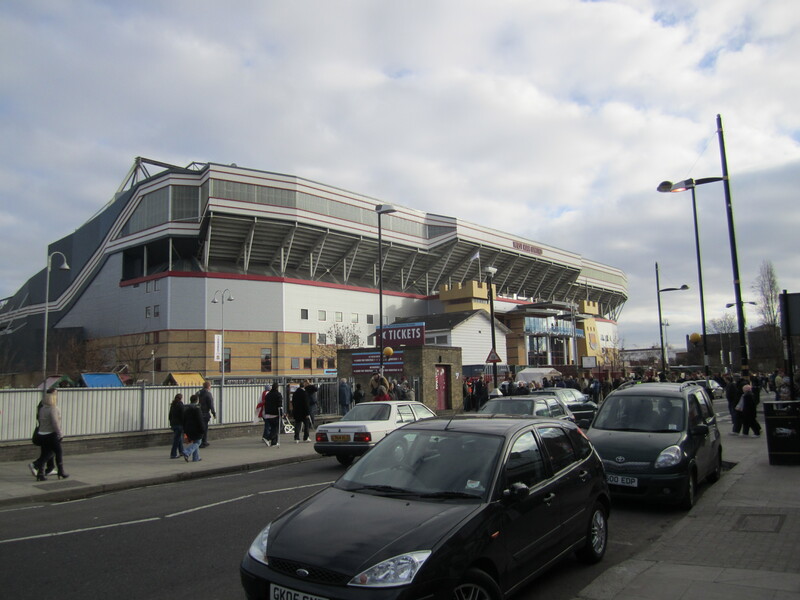 Now, getting to and from Upton Park, their stadium, was a bit tricky and very nerve wracking. It was it the furthest I’ve ever ventured from my dorm, and to make matters worse, the train line that takes me literally to the front gates of the stadium was closed. That meant having to use multiple modes of transportation (including the bus which still is scary to me). Fortunately for me, as was the case at Fulham, I was not the only person from Central London going to the game. When I got off the train I didn’t even look at my handwritten directions, but simply followed the hundreds of claret and blue clad people that got off at the same stop. We then trekked to the bus stop around the way and got canned inside the first bus to come by. Good news: it was free because of the fact the train was not running. Bad news: there were probably about 120 people on one bus. I kid you not I felt like a sardine. 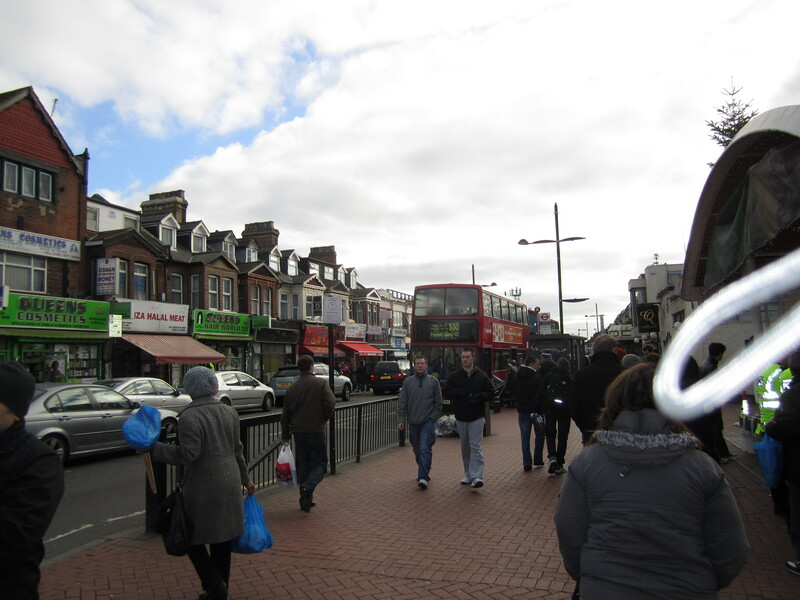 The area itself was a complete shift of what Fulham was like. There were shops and food vendors everywhere. Also, it seemed a bit more run down and lower class, but more on that later. I ate my regular 2 pound lunch I had bought earlier, got my ticket and stepped inside. 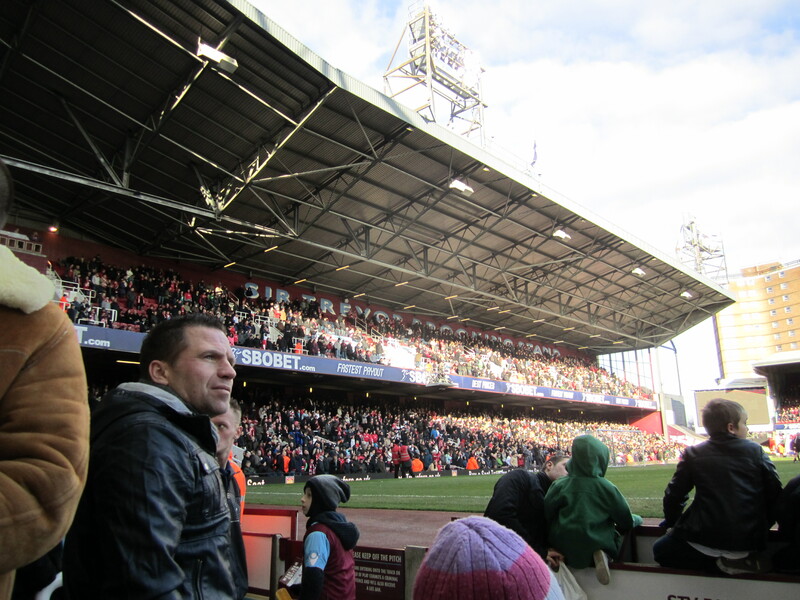 Upton Park was a lot bigger than Craven Cottage. I’d hazard to guess that it was about twice as large. The pictures I took don’t do it justice because I was sitting in the largest side with three times as many seats as the side I was facing. Once again I had great seats, a bit off center but in the second row. The seats were a bit on the small side though, so I rubbed elbows with the people next to me quite often, hence the lack of pictures and videos. Which leads me to a quick analysis of the people at the game. On the whole, West Ham fans seemed to be rather lower class, especially compared to the Fulham fans. I know I am making a complete over-generalization of a fanbase from a rather limited experience, but those are my two cents. In the row behind me was a guy straight from a cheesy 80’s UK gang movie. He had a blue, matching track suit on and a pair of vintage adidas shoes. He was also sporting this awful, gaudy, silver bling all over the place. He just reeked of cheesy drug dealer. To my right was this couple, also very, how shall we put it, interesting. He was dressed well enough but had teeth straight from Austin Powers and smelled of cheap vodka. His lady, looked to be about 25 years older than him (and I would peg him in his mid thirties) and had enough make up on for three women. Of course I didn’t take pictures, so you will have to believe me on this. Every other word coming out of their mouths was a swear. Bleepin this and bleepin that. You couldn’tmake up this stuff. Anyways, now that I’m done unjustly criticizing others, the home fans were a bit dull on the whole. It had a lot to do with their team not being very good this year and playing all sorts of terrible in the first half of this game. Below is their “fight song” as made famous (at least to me) by the movie “Green Street Hooligans.” Listen for the little boy singing and that will show you that even through the toughest of times, these fans still love their team. What also made West Ham fans seem dull was the raucous fan section for the opposing team. Nottingham Forest. When you watch the video below, remember that all the noise you hear is coming from the visiting fans. It’s incredible stuff. Things got chippy early on and the police had to stand as a human barricade between their fans and the West Ham fans. It would have been cooler to see if I hadn’t been so close to the impending action. All I could think of was where would be the best place to run and hide, haha. But everything was groovy and no melees broke out. The game turned out to be quite a thriller as West Ham scored first, only to concede two goals back to back. This made the home fans irate because as bad as West Ham may be, they were still playing a team that was in the minor leagues. Just before half time, West Ham scored a crazy goal to tie it up going into half time. In the second half West Ham controlled the action, threatening the goal time and time again before scoring on a penalty kick. I left with a minute to go to beat the rush of 30,000 people getting on one bus and did just that. Overall, another great and exciting day of soccer in London. P.S.- I got another 5 pound scarf as you can tell in the first picture. Can’t beat that.